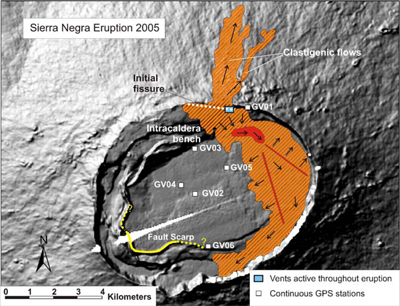 A team of scientists investigated the 2005 eruption of Sierra Negra volcano in the Galápagos Archipelago using GPS and InSAR data as well as petrologic and geochemical analyses. Dennis Geist (University of Idaho), Karen Harpp (Colgate University), and Terry Naumann (University of Alaska) were in the field during the eruption, while William Chadwick (Hatfield Marine Science Center, Oregon State University) collaborated remotely. Their results were recently published in the Bulletin of Volcanology (Geist et al., 2008). This work was supported by grants from the National Science Foundation. Installation, operation and maintenance of the GPS network on the volcano were handled by UNAVCO. Sierra Negra volcano began erupting on 22 October 2005, after a repose of 26 years. A plume of ash and steam more than 13 km high accompanied the initial phase of the eruption and was quickly followed by a ~2-km long curtain of lava fountains. The eruptive fissure opened inside the north rim of the caldera, on the opposite side of the caldera from an active fault system that experienced an mb 4.6 earthquake and ~84 cm of uplift on 16 April 2005. The main products of the eruption were an `a`a flow that ponded in the caldera and clastigenic lavas that flowed down the north flank. The `a`a flow grew in an unusual way. Once it had established most of its areal extent, the interior of the flow was fed via a perched lava pond, causing inflation of the `a`a. This pressurized fluid interior then fed pahoehoe breakouts along the margins of the flow, many of which were subsequently overridden by `a`a, as the crust slowly spread from the center of the pond and tumbled over the pahoehoe. The curtain of lava fountains coalesced with time, and by day 4, only one vent was erupting. The effusion rate slowed from day 7 until the eruption’s end two days later on 30 October. Although the caldera floor had inflated by ~5 m since 1992, and the rate of inflation had accelerated since 2003, there was no transient deformation in the hours or days before the eruption. During the 8 days of the eruption, GPS and InSAR data show that the caldera floor deflated ~5 m, and the volcano contracted horizontally ~6 m. The total eruptive volume is estimated as being ~150×106 m3. The opening-phase tephra is more evolved than the eruptive products that followed. The compositional variation of tephra and lava sampled over the course of the eruption is attributed to eruption from a zoned sill that lies 2.1 km beneath the caldera floor. UNAVCO Project Manager Jim Normandeau was able to provide crucial remote technical support for the successful repair of a GPS receiver that had failed before the eruption. So, important data could be recorded in a location within 500 m of where the 2005 vent opened. Figure 1 - Photograph of the eruption on 24 October taken by Greg Estes from the southeast. By this time, the original ~2 km fissure was erupting only from its eastern margin. 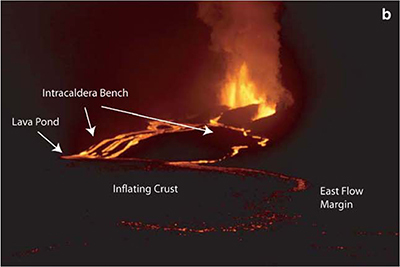 Four lava channels can be seen spilling over the intracaldera bench and feeding the caldera floor flow, whose eastern margin is incandescent and in the foreground. Figure 2 - Shaded relief map of the summit area of Sierra Negra volcano. The 2005 lava flow is shown in orange, with arrows indicating flow directions. Red lines indicate clefts from which the lava flow spread during inflation. Red region is location of the perched lava pond that fed the interior of the flow after its initial emplacement. Figure 3 - Position changes across two baselines, expressed in three directional components and spanning the duration of the eruption. 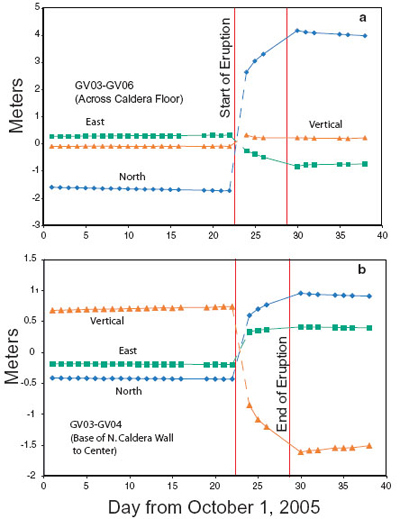 The first baseline is between the north and south margins of the caldera floor (GV03–GV06; Fig. 2) and the other from the northern caldera floor to near the caldera center (GV03–GV04). Subsidence and contraction rates decelerate over the course of the eruption. Inflation began within a day after the end of the eruption on October 30. 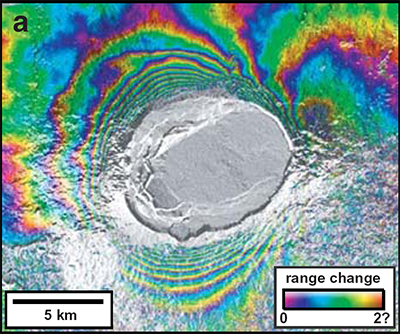 Figure 4 - ENVISAT beam mode 2, track 61 interferogram spanning 24 September to 29 October 2005 showing broad subsidence of Sierra Negra volcano. The caldera is incoherent due to modification by lava flows and high deformation gradients.